Slick St Michael's surpassed Terenure and Blackrock in producing the most impressive performance of the first round to date against Kilkenny at Energia Park. They looked like a well-oiled machine as they went through phases to strike early through prop Jack Boyle. A Stephen Woods offload and a crossfield kick by Chris Cosgrave were the key ingredients in Edward Kelly's finish in the 12th minute. Despite a Charlie Tector try for Kilkenny, Michael's were in a hurry to close the game down, scrum-half Rob Gilsenan arcing over. Gradually, Kilkenny came into it with flanker John Rogers and Andrew Ross and Matthew Hodgins doing well, albeit before Cosgrave's penalty had it 24-3 at half-time. 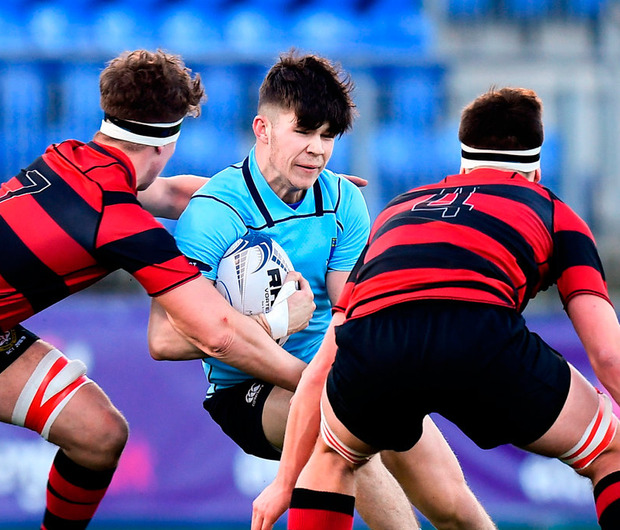 The Marble City school never dropped their intensity even when Boyle pounded out his second try and centre Andrew Smith followed suit for the fifth, both converted by Cosgrave. Kilkenny finally began to shift the ball to powerful wing Success Edogun and their only try came from his surge, converted by Tector. St Michael's - R van den Akker; E Kelly (Z Harrison 53), A Smith, S O'Kelly (H McWade 63), M O'Brien; C Cosgrave, R Gilsenan (J Woods 63); J Boyle (J Boland 63), L Barron (B Victory 11), F Finlay (J Power 45), S Woods, J Fish (L Dunne 63), J Guinane, M Hernan (capt) (C Booth 63), W Hickey. Kilkenny - M Hodgins (C Cantwell 63); S Edogun, A Ross, R Strong, A Strong (J Crossley 63); C Tector, L Kerr (G Power 57); C Chamney (J Akanji-Murphy 65), D O'Reilly, S O'Sullivan, J Caldbeck, N Pim (R Jacob 59), J Rogers, H Steacy (G Culbert 42), D Thompson (capt).